Holly is back in Wirralong after a devastating loss. She’s a doctor, but can’t imagine practicing medicine while being responsible for her sister’s twin sons. She’s running the local coffee shop instead. Ben was Holly’s teenage crush, but she never gave him a chance to become more than just a friend. He’s back in town to work as the local doctor. Holly can’t imagine he’d like to spend time with her after she rejected him many years ago, but the opposite is true. He's nothing but kind and supportive. Will Ben be able to break down her walls this time? Ben is surprised Holly is back in Wirralong. There's never been another woman for him and he’s glad he has the chance to get to know her as an adult. Holly’s situation is complicated, she’s taking care of her nephews and is trying to get over the death of her beloved sister. She isn’t looking for love and if Ben wants to form a connection with her, he has to tread carefully. Will he have enough patience not to chase Holly away and can he convince her that they are made for each other? Holly’s Heart is a moving romantic story. Holly’s been through a lot and needs all the support she can get. She’s a strong and capable woman, but she’s also traumatized and needs help facing the demons of her past. Ben’s lightheartedness and gentle and caring nature have a healing effect on her and I loved how deeply he cares about her. Fiona McArthur shows her readers exactly what her main characters are feeling and I liked that a lot. It made me feel close to Ben and Holly and I was incredibly curious about what would happen to them. Ben and Holly are made for each other and I really enjoyed watching their relationship flourish. Fiona McArthur writes about the tragic parts of life in an amazing empathic way. She combines this with hope, plenty of unconditional love and beautiful friendship, which is a terrific mix. I loved Holly’s Heart. It’s a story filled with warmth and compassion. I loved that there’s happiness after devastation and I liked that the power of love conquers all. I enjoyed this fantastic compelling love story from beginning to end. I’ve loved the Outback Brides series andHolly’s Heart, the last of the four stories, is a fitting end. This story is a gentle one filled with kindness and hope. Both Ben and Holly started their lives in Wirralong, Ben in a well-heeled grazing family and Holly in a single parent home. Ben has loved Holly since she was a teenager, and Holly has loved him back though she’s realistic enough to understand that if she’s to make anything of herself she needs to study and do well at school and university. Having pushed Ben away as a teenager she is pretty mortified to see him back in town and doing the job she always dreamed she’d do herself. Ben is the town’s new doctor, while Holly, also trained as a doctor, is running the Outback Brides Coffee Shop. These two are gentle and caring people. Holly has come home with her dead sister’s twin sons, whom she has adopted, and her life revolves around helping them to overcome the loss of their mother. Ben is kind and doesn’t pressure Holly despite his ongoing love for her. This story is almost ethereal at times. I felt as though I were floating through it. The plot is gripping but with such nice people in this story the peaks and hollows are gentle. I loved the idea of such caring people having a second chance at love themselves. 5.0 out of 5 starsA Read Full Of Heart! 5 Stars! The story continues the portrayal of nice characters in a narrative set amongst the backdrop of Wirralong. Holly and Ben’s story is a sweet read full of heartache memories that add layers to what is an unmissable read within the series. 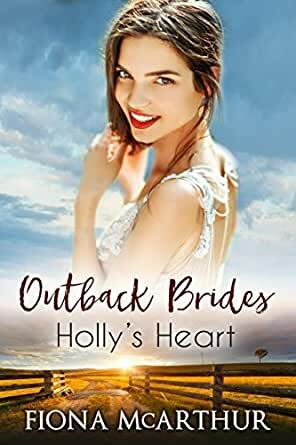 Holly’s Heart by author Fiona McArthur is amongst the best reads in the Outback Brides series for this reader, and one that was a nice HEA story. 5.0 out of 5 starsEasy read, suitable for all ages. Well written light romantic book. Love this author.